It's hard to blog about food after a brief bout of stomach troubles, but I needed to blog about this food while it was still fresh in my memories. Mike and I have been anxiously awaiting the opening of Shake Shack in the Domain. I was out running wedding errands with my sweet friend, Cassie, and saw that it was finally open. I picked Mike up from work on Friday and we headed right back to enjoy some burger heaven. The location had a classy, casual vibe and was not super crowded for being recently opened. The menu was not overly complicated with your basic burgers, fries, shakes, and a few other items. I opted for the Miso Caramel Shake, fries, and a single cheeseburger. Mike ordered a chocolate shake, cheese fries, and a double cheeseburger. The food arrived fairly quickly and looked delicious. It tasted about as wonderful as it looked. I loved my caramel shake and the salty crinkle cut fries. The burger was pretty good, too. Mike declared the cheese fries to be the best he'd ever had. After finishing, we were quite stuffed. We opted for a quick walk around the Domain to burn off some of the excess calories. Our walk was short lived because I was quickly falling into a deep food coma. Once we got home, I became glued to the couch until bedtime. 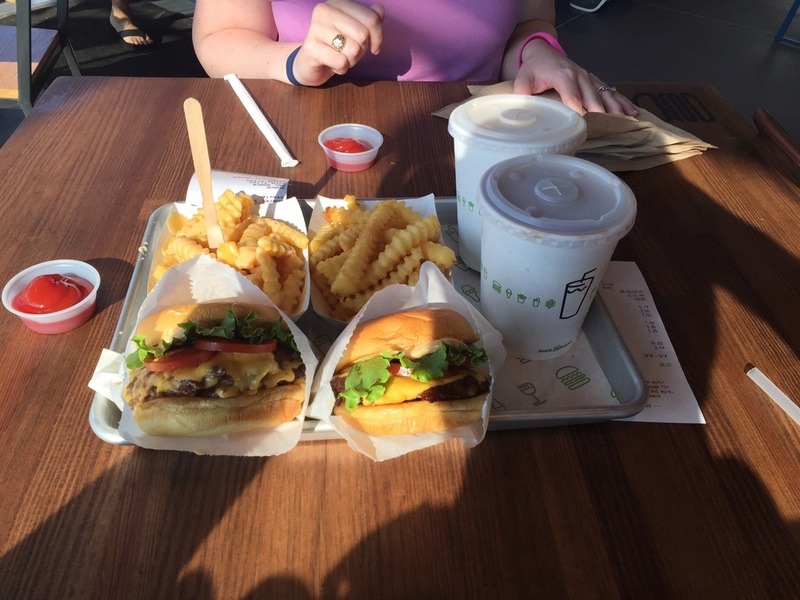 We liked the food at Shake Shack, but next time we visit, we will have to take it a bit easier.